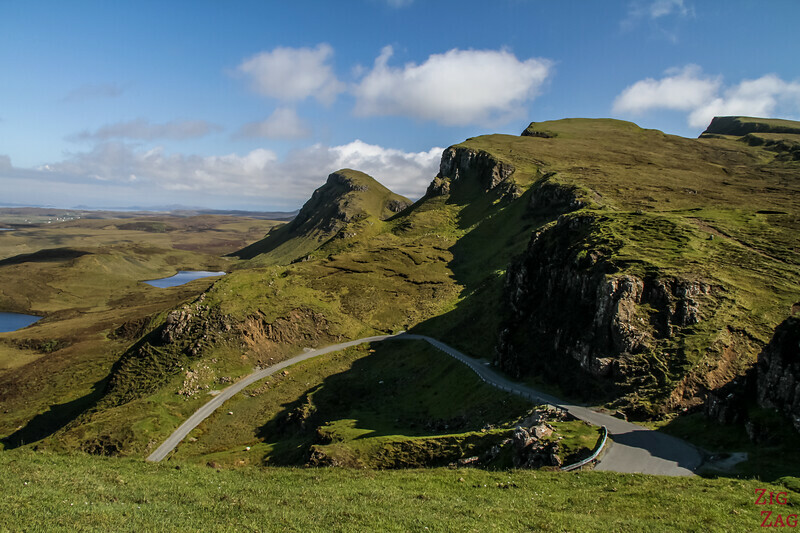 Quiraing Skye is one of the most famous views on the Isle of Skye Scotland. 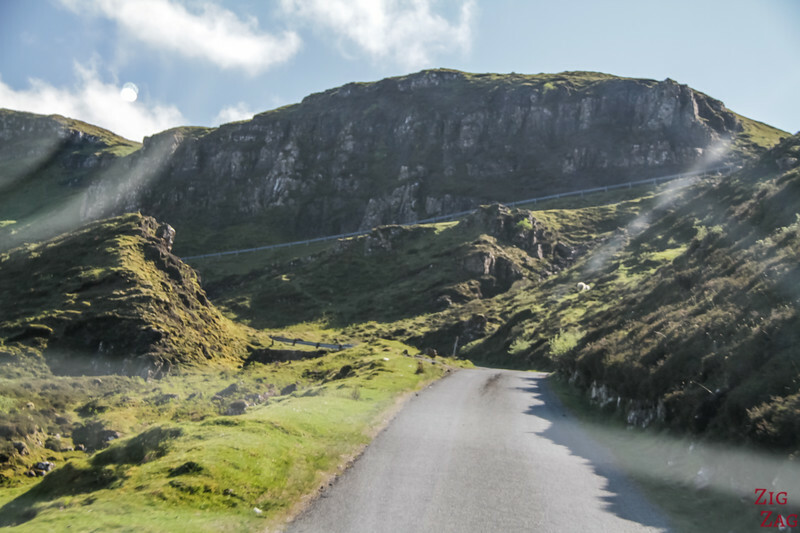 A short drive takes you up to the Trotternish ridge and the Quiraing Mountain Pass where you discover stunning mountains, dramatic rock formations, small lochs and if lucky a view all the way to the seashore. 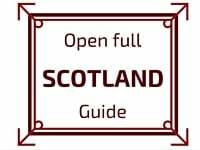 Here is my guide to help you plan your visit. 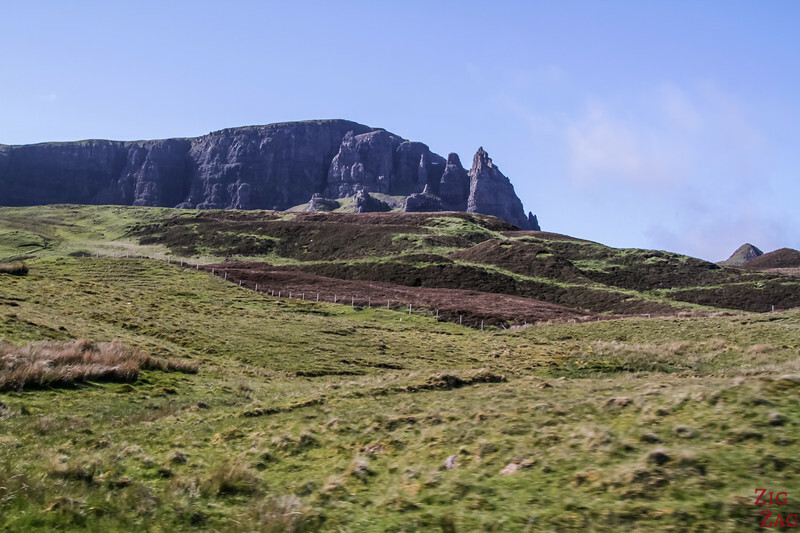 With the Old Man of Storr, the Quiraing is on of the top points of interest of the Trotternish landslide and of the isle of Skye. It offers one of the best views of the Island all the way to the sea on a clear day. 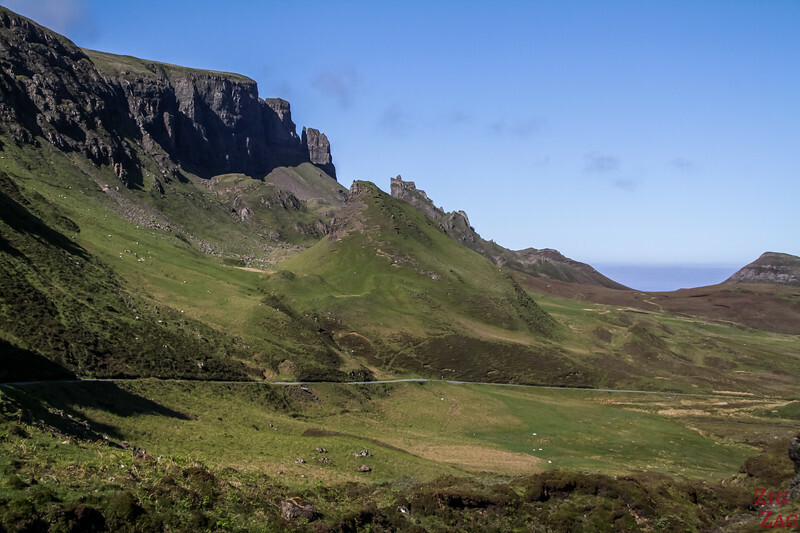 And before you keep reading this article, you might want to check out the pronunciation of Quiraing to make the reading easier. You can listen to it here. 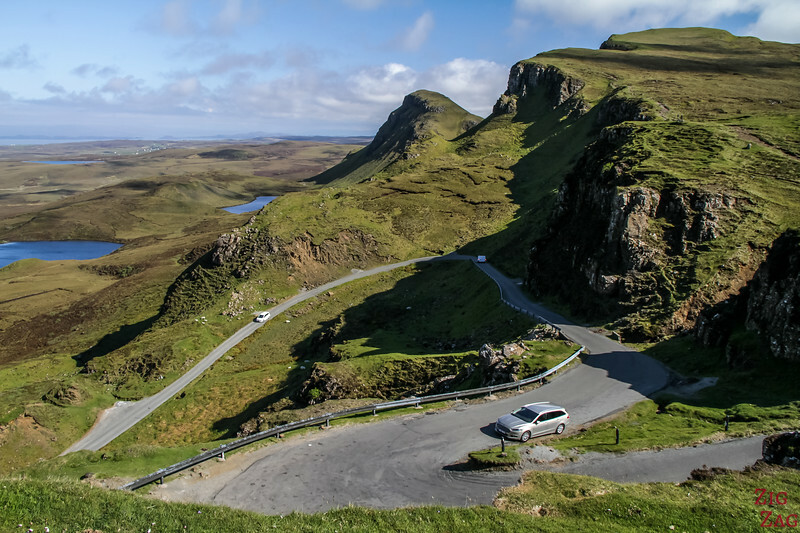 Let's start with a short video of Quiraing Isle of Skye : have a brief look at the drive and the view from the ridge. 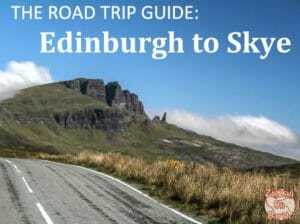 How to get to Quiraing Skye - Where is the Quiraing view? The drive to the parking is on a single lane road (with passing places) and takes 8 minutes. 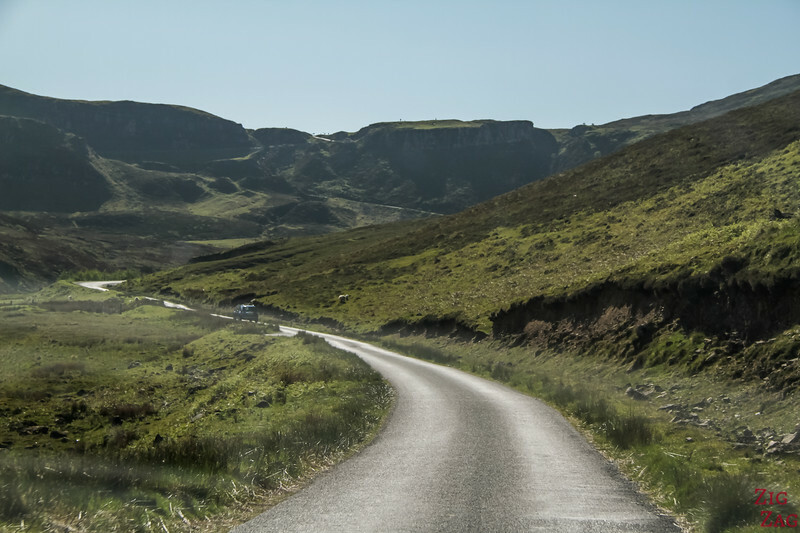 The single lane road is in good condition and has many passing places with proper visibility. 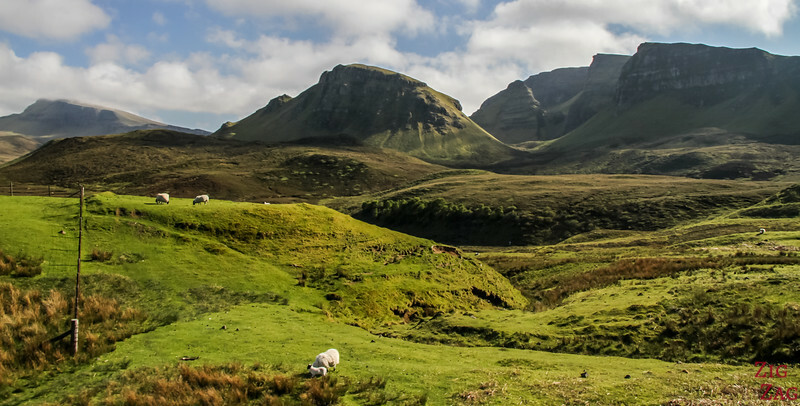 Be careful, as you will see in the next paragraph the views of the Trotternish ridge are stunning and might distract you from traffic. Once you reach the climbing part of the road, slow down. 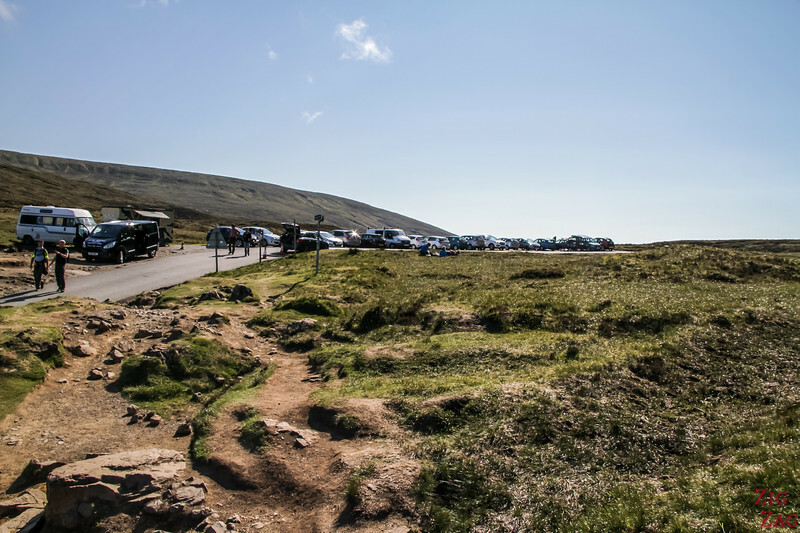 There are no more passing places until almost the top so check if cars are coming down. 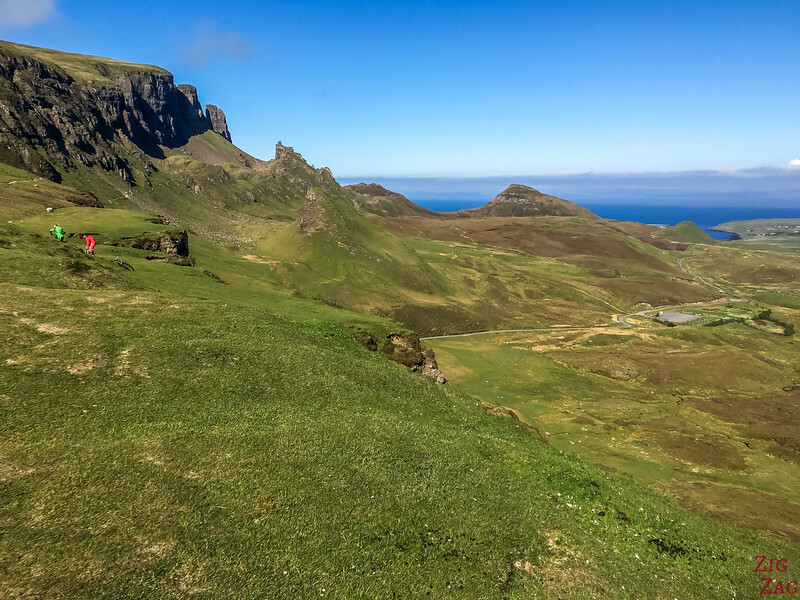 On the way to the Quiraing Skye viewpoint, the views are already impressive with the Trotternish ridge on both sides. 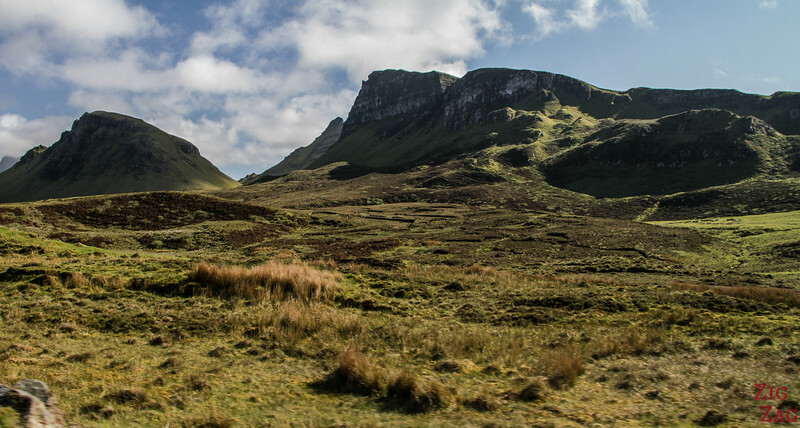 According to AGU, this impressive ridge is the result of thick layers of basalt overlying weak sediments. from the Jurassic. The weight triggers faults creating large landslides. Movements continue today but at a low rate. 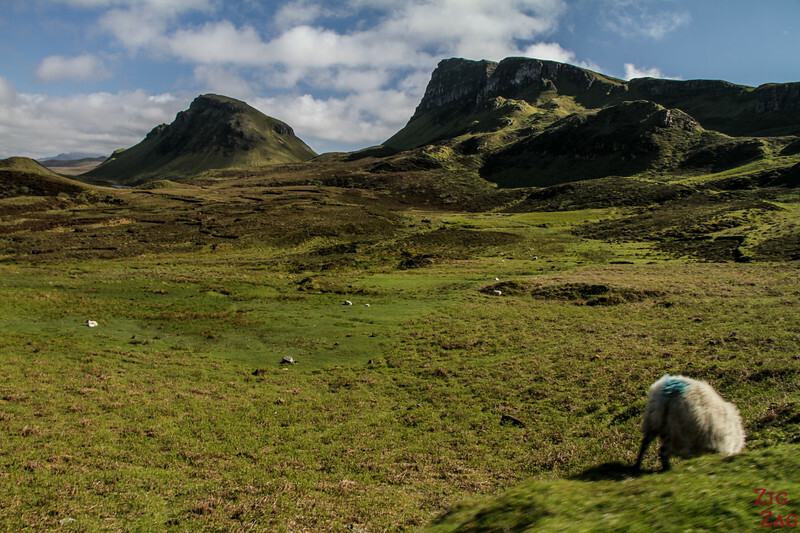 As I mentioned before, be careful, the sheep are roaming free. 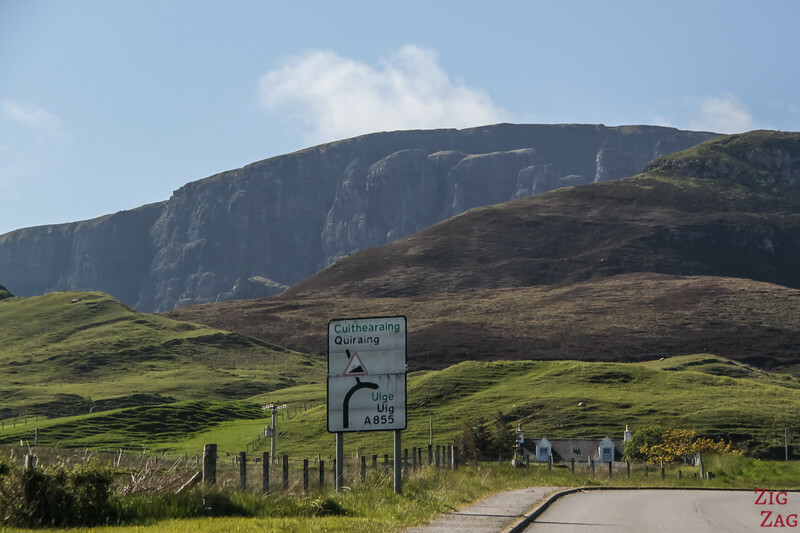 After parking, it is time to explore and discover one of the most famous views in Scotland. 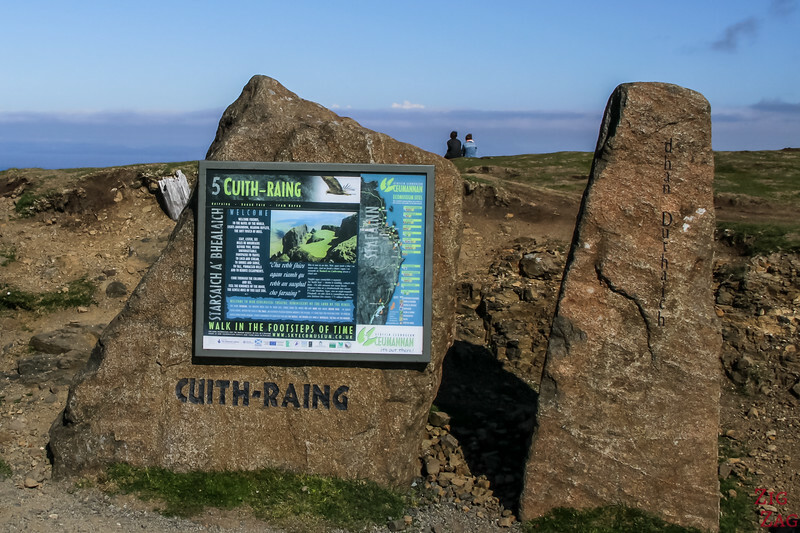 As you can see in the sign below, the local version of the name is Cuith-Raing and I have no idea how to pronounce it. This is a 7 km loop that requires 3 hours of walking (if not stopping)​. It is rated as hard for technicality. Ascent is 340m. 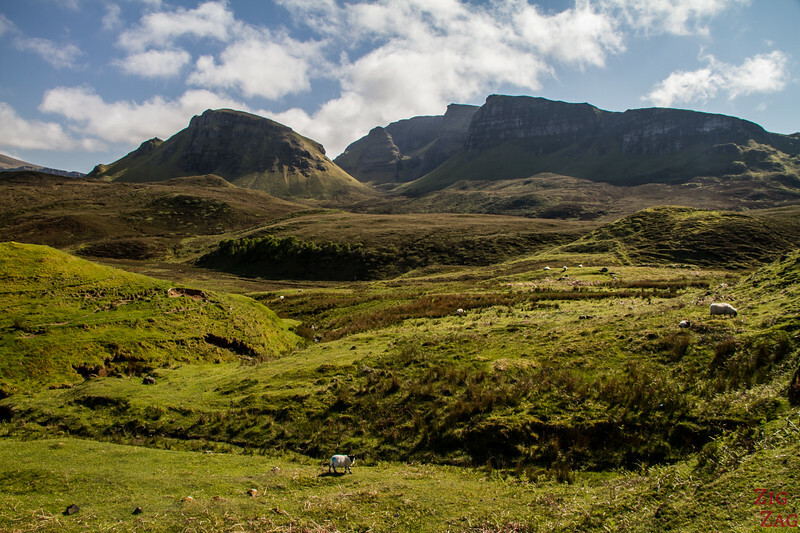 It will take you near cliffs so do not hike when windy or with low visibility. You could see crazy shapes. For photos check some User Reports on the walk description page. Beautiful view, don't you think?